Arnout Visser runs his design atelier from Arnhem. 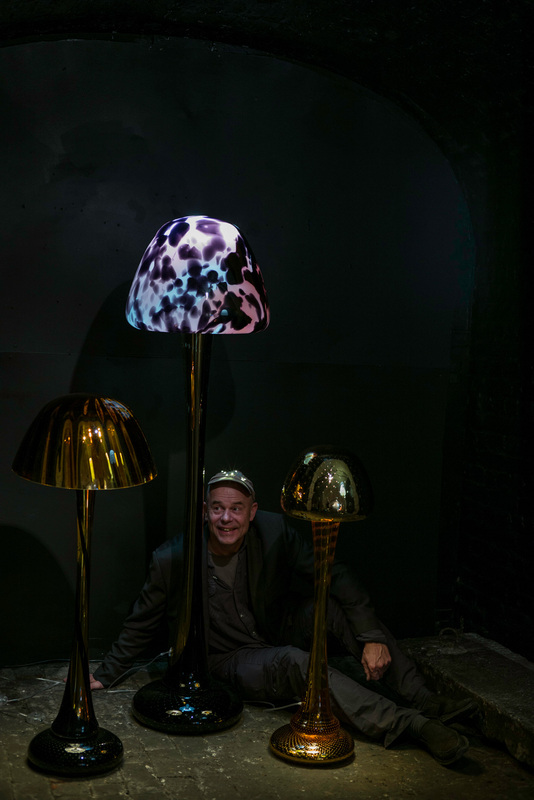 He will be presenting his Big Mushrooms light at the London Design Festival this September. Anna Bates: How did you develop the designs? Arnout Visser: All my designs start with an idea but then things go another way. You have to be quite flexible when you work with glass. There is no computer needed – you just have to keep your eyes open. I call myself a form finder – I’m not trying to develop nice shapes, I work on a process. We do some glass blowing tests, sometimes things go wrong, and sometimes they go right – sometimes you get an idea for free! AB: Why do you like to work with glass? AV: To get a shape, you blow – this method of construction is different to all other materials. Nothing has really changed in the production of glass in 500 years; things are automated now but the tools are the same and glass is still blown by glass masters. AB: What it the process of making these Big Mushrooms lights? AV: First they heat the material up for a night – eight hours. We start in the morning at 5.30 when the glass is liquid hot. It’s like a living material – when it is going to rain you see the difference in the glass. The blowpipe is given to the guy on the balcony, and he blows the glass downwards to make the huge stem for the light. As the liquid glass is falling they keep some air in it so that a tunnel forms in the middle – this is used to run the wires and the LED light through. 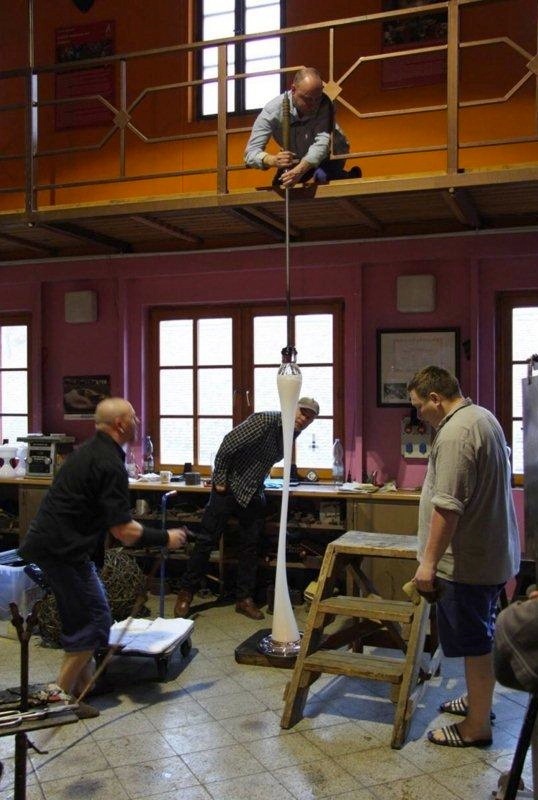 A normal glass project has a maximum height of 1m high – these are 2m. At the beginning the glass blowers were really against the idea and said it was not possible. Then there was some beer and tests and jokes and we achieved it. But it often happens during the process that something goes wrong and the whole things collapses – or spontaneously explodes, like a grenade. I have the electronic equipment to measure the temperature but they don’t like it. They see and feel the temperature. They’ll shout: 480 degrees – hurry up! AB: It sounds like a very collaborative project. AV: The social aspect of working together with these people is very important – they put in all their effort and their sweat to make it happen. About twenty people are involved from the beginning to the end – and they all add something important. I’ve worked for 25 years to build up relationships with glassblowers. We talk about the possibilities, then the moment the glass is dipped the glass master is in charge and I am the assistant. AB: The lamp is made in several parts – how is the stand, and the mushroom-shaped shade developed? AV: The shade is blown into a wooden mould – a glass optic mould. We use different size moulds so that they are always different. Then to create the patterns we use silver nitrate, and shellac to seal the silver. It’s been done this way for 500 years. AB: Why do you use LED? AV: Using LED is a big advantage in glass; they don’t create much heat so you can build it into the light. It’s been great for my experiments and form finding, as I’ve built new shapes that are closer and thinner, that just weren’t possible before. Big Mushrooms were part of the exhibition Enlightened Design II during the London Design Festival 21-24 September 2017 at The Crypt Gallery, Euston Road, London NW1 2BA. Click here for more information.